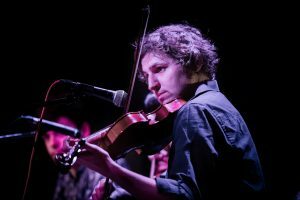 Mikey Kenney is a fiddle player and balladeer from Liverpool, whose playing is steeped in both English and Irish traditional music. Well known as a constant traveller and collaborator, Mikey is a member of the acclaimed Robert Burns’ celebration Band of Burns and works regularly with Italian legend Vinicio Capossela. Mikey’s new solo album, The Reverie Road, allows the listener a dreamy, intriguing journey to quell the world-weary soul and transport it to another time and place. Inspired by his home city of Liverpool’s haunts, traditional fiddle music, poetry and lands farther afield, this album is at the forefront of creative and imaginative music-making through melody and rhyme. Nick Hart & Dominie Hooper are a captivating new duo who debuted on the folk scene in 2017. 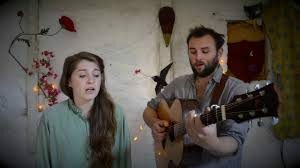 They present folk songs collected from around Britain, with stunningly clear vocal harmonies and the thoughtful accompaniment of Nick’s subtle, finger-picked guitar. Expect charming and informative insights into the often obscured genre of English Traditional Song.